opinions are entirely my own. 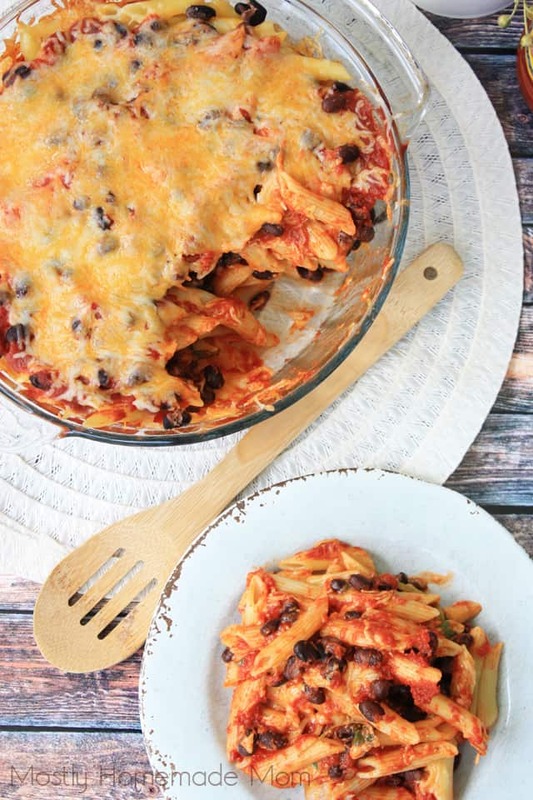 This Spinach and Black Bean Penne Casserole is the perfect meatless weeknight dinner! A dinner the entire family will enjoy! For the Miller family, summer break is only a few short weeks away now. I can hardly believe it! This school year went by in lightning speed. It’s been a crazy year, but I’m so impressed with how far both Silas and Wesley have come. Silas began the year still reading picture books, and he is now fully able to read chapter books with absolutely no problem. Wesley started Kindergarten still learning some of the letter sounds, and he now blows us away with how much he is able to read. I can actually have him sit down and read full picture books to Reuben! Their little minds continue to amaze me every day. I’m really excited to plan fun day trips this summer with these crazy boys. There are some amazing hiking trails, creeks, and parks within driving distance. We might even sneak in a quick trip to the beach – we haven’t been back to the New Jersey shore for 2 years now. I miss that salty air and sea breeze! 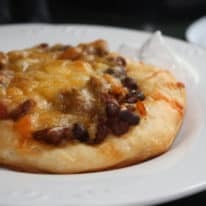 With so many things to look forward to this summer, I know I’m going to need a list of some really delicious, and really easy dinners to whip up when time is short. I also would love to get on more of routine of making dinner at home in order to free up that money to spend on excursions here and there. While I do try to look up last minute deals on admission tickets to local places, the price tag for the five of us to go somewhere often adds up quickly. 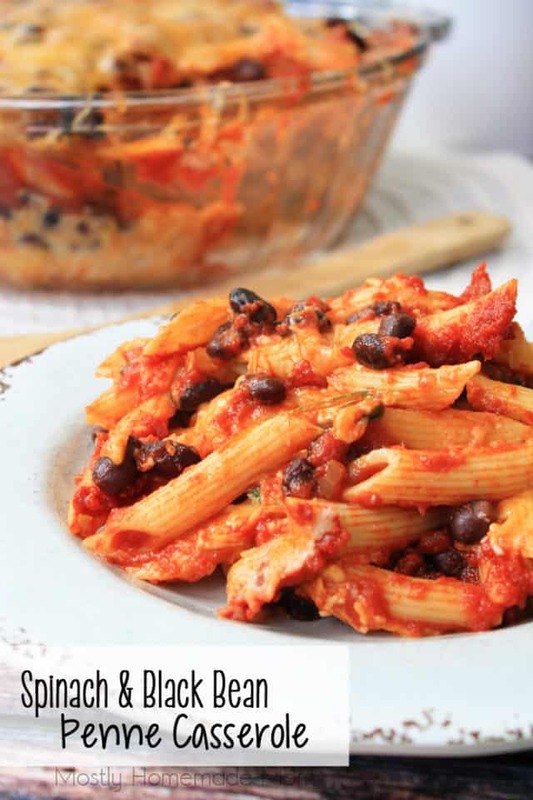 This Spinach and Black Bean Penne Casserole is both affordable and easy! You really can’t go wrong with these ingredients! 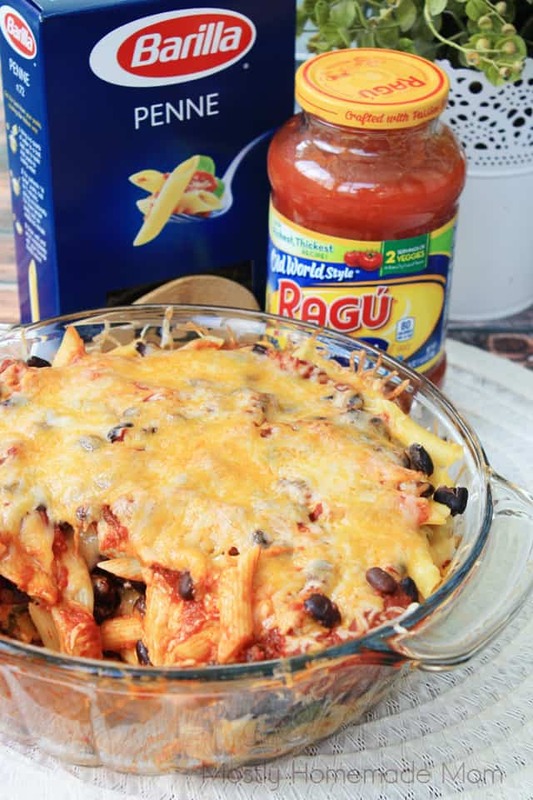 Penne pasta layered with fresh spinach leaves, black beans, sauce, and cheese, and baked in the oven in a casserole dish. Cook penne in a large stockpot until al dente, according to package directions. Drain and return to pan. Spray a 4 quart casserole dish with nonstick spray. Spread half of cooked pasta into dish. 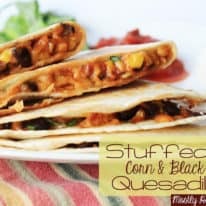 Sprinkle half of black beans, then half of the spinach leaves, half of the jar of sauce, and 1 1/2 cups of cheese. Repeat layers with remaining ingredients. Cover tightly with foil and bake at 350 degrees for 30 minutes. Remove foil and bake an additional 5 minutes or until cheese is completely melted and casserole is warmed through. Serve immediately. I honestly cannot believe how quickly this casserole was eaten in this house! I paired this dinner with a side salad, which was just the perfect touch. Next time, I plan on having some cheesy garlic bread to enjoy with it as well. The boys go crazy for garlic bread, too!